Design Guide: Leather Wrap Bracelets with Czech Glass Beads! The Craze of Multi-Hole Czech Beads! Hi Everyone! We’ve been promising you this tutorial and here it is! These bracelets are easy to make and fun to wear. The bracelets featured here consist of Super Duos but you can use any Czech glass bead or bead of your choice. Keep in mind that some beads are more difficult to work with…. We’re excited to announce the arrival of lots of pretty new colors and finishes of our exquisite SuperDuo Czech glass seed beads. 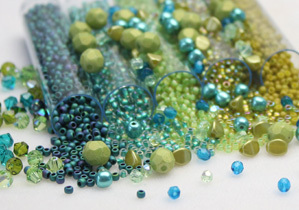 These high quality two hole seed beads are versatile and fantastic for all manner of projects. Take a look at all the newest colors! Happy beading!